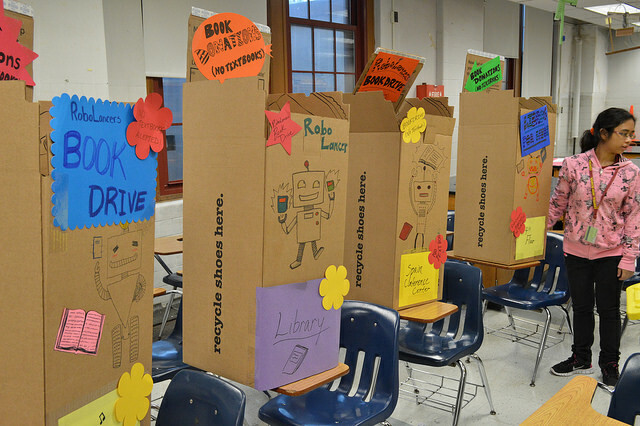 The RoboLancers are currently holding a canned goods and book drive. Located in various locations of Central High School there will be bins and boxes. The bins will be used for the canned goods while the boxes are for books. However, textbooks or damaged books cannot be donated. The boxes and bins are not plain and dull. The Marketing team has been working hard in decorating them with various designs and by putting up posters around the school. As part of Marketing I had fun in drawing and decorating the boxes. I’m hoping that people will be donating. We are hoping that we will be able to exceed 900 lbs of books, which was last year’s amount by having everyone in the team donate. The book drive will end on October 18th and the canned goods drive will end on November 1st.